I can hardly believe that I’m already back from Catania, Sicily. Two weeks ago, I received an e-mail out of the blue from Iula, a kind lady at the Italian Consulate in Montreal describing an economic mission that would send a group of Canadian importers, merchants, journalists, and bloggers to Catania to connect with local artisans and producers with the hope that the mission would help bring about awareness of this region. I was asked if I would care to join. I was flattered to be invited, and although I have yet to figure out why I got so lucky, I immediately said “yes!” and started counting the days. I had actually dreamed of going to Sicily later in the year – sometimes, things just happen in the best way! The people who were hosting us (the Catanian Chamber of Commerce) were very generous and helpful throughout our stay. It turns out that I was one-of-a-kind in this group, which was composed primarily of food and wine importers, so I feel like I was lucky: I got to speak to everybody and taste everything, without the pressure of having to close any deals. I must also say that I was given complete freedom: I wasn’t asked to promote anything in particular and wasn’t given a specific number of posts or tweets to write. So, I’ll get this out of the way: anything I will choose to write about will be my own decision. The trip has lasted only 6 days, but I feel like I have tons to share! 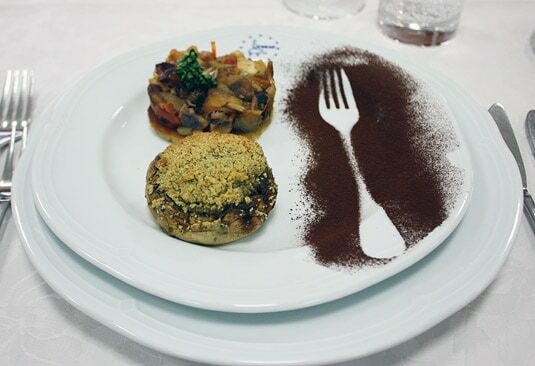 On our first day, we were invited to lunch at a culinary and hospitality institute where the chef-instructor, Danilo De Feo, along with his students, would prepare us a meal composed of Sicilian specialties. I thought that bringing us to a culinary school was a great idea as it allowed me to become familiar with some of the dishes the region is best known for and to learn what was in season while we were there. 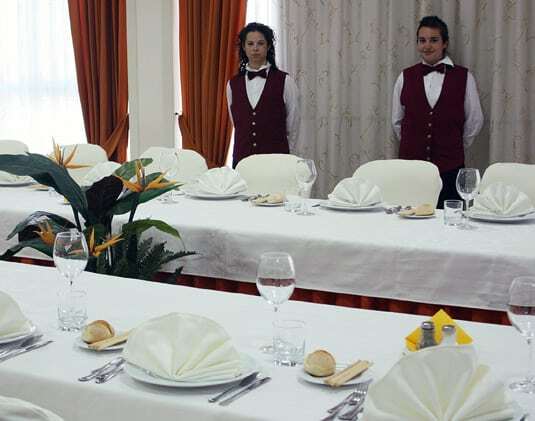 Our delegation was seated in a large banquet room and a generous (Italian-style) five-course meal began. Here’s what we enjoyed. The meal started with an antipasto plate. 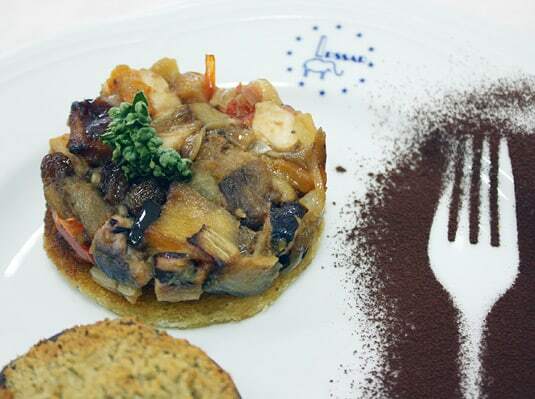 At the top was a traditional Sicilian caponata, served over a round, toasted piece of bread. What’s particular with Sicilian caponata is that it is an “agro-dolce” dish, meaning that it hits a perfect balance between sourness and sweetness. This specific version combined octopus, eggplant, onions, raisins, white vinegar, sugar, and finally, cocoa, for a touch of bitterness. This spectacular combination was so delicious that the second antipasti on the plate, a stuffed mushroom, seemed a little bland in comparison. 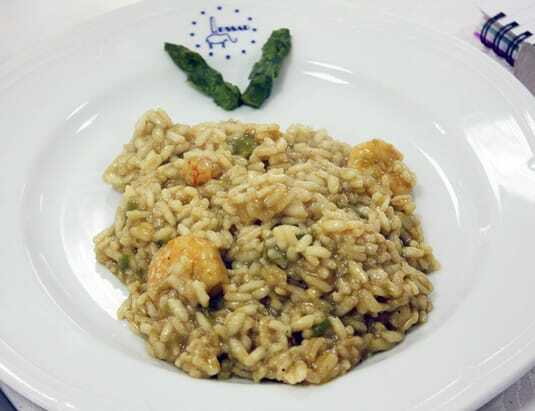 The second dish: an asparagus and shrimp risotto—perfectly al dente, of course. The third dish looked quite spectacular: hand-made cut tagliatelle with a squid ink sauce. 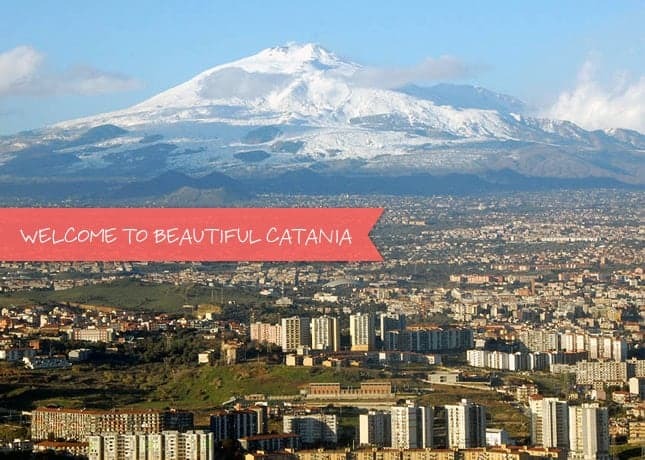 One can’t come to Catania without noticing the Etna, a huge volcano that serves as a breathtaking backdrop to the city. 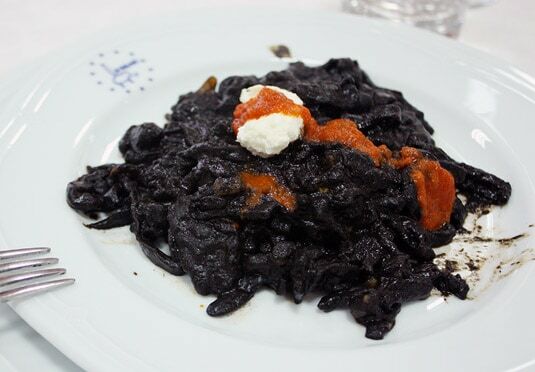 This dish was cheekily plated in honor of the volcano—the black pasta topped with ricotta, representing the snow that covers the volcano’s summit, and tomato sauce, in lieu of lava flowing down the sides. The fourth, very generous plate arrived as everyone begged for mercy, having eaten so much already. Giant prawns, tender and so flavorful, were rolled into prosciutto and pastry dough, delicate white fish fillets were simply breaded, and mussels were topped with quite a thick layer of crunchy breadcrumbs. I tasted everything and it was fantastic, but I thought less breadcrumbs on the mussels would have allowed their flavor to come through a lot more. A creamy spinach and ricotta flan accompanied the seafood. 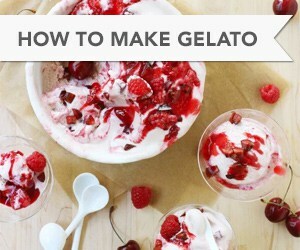 Dessert included a trio of iced treats: a lemon granita, quite tart and perfect to cleanse the palate; a fior di latte gelato with candied orange zest; and a luscious pistachio gelato, the most memorable of them all. 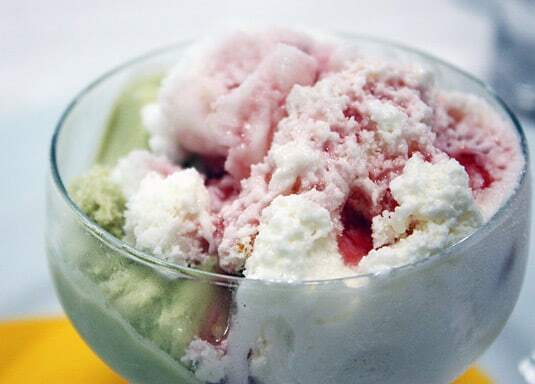 It was so incredibly creamy, and the taste of pistachios was so pure and strong—it was the best gelato I had ever had by a long shot. 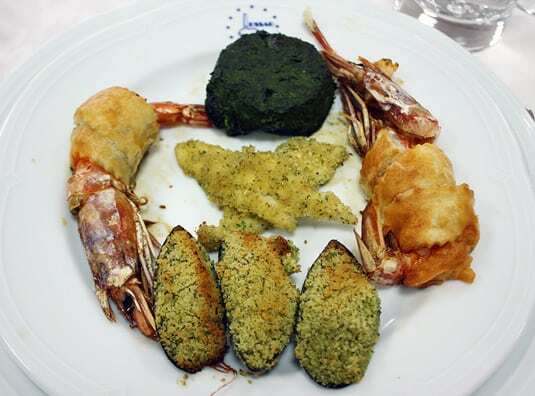 Of course, Sicily is renowned for its great seafood, and this meal highlighted this fact in a memorable way. My favorite discovery was the caponata, which offered quite a complex flavor. 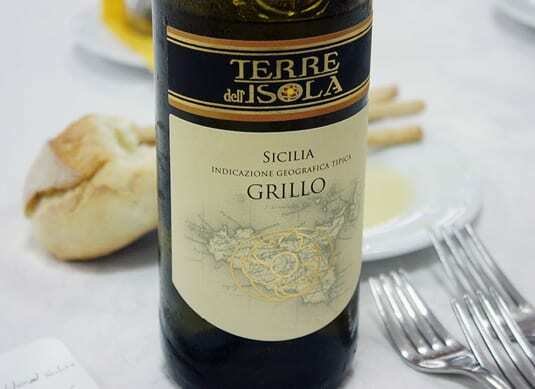 It also perfectly matched the white wine that was served throughout the meal, a Grillo, made in the region. My wine expert colleagues described it as a dry, bright, slightly smoked wine with a strong aroma that matched the caponata’s rich flavors perfectly. I chatted a little with the chef, a passionate and energetic man who described the dishes throughout the meal. He told me he manages five schools around Catania, and he was very proud to announce that he would cook for us again for a special gala dinner on Friday night. I loved this 101 course on Sicilian cuisine and this meal was just a foreshadowing of all the great things we would taste over the course of our stay in the region. A big, heartfelt thank you to Iula Casale at the Trade Promotion Office of the Consulate General of Italy in Montreal, and to the Chamber of Commerce of Catania, for generously inviting me to discover Catania, a beautiful and delightful city.